Howdy folks. Hope you are enjoying the weekend. Shame we have to go back to work tomorrow, isn't it?! However, why not spend your last day of freedom creating a card for this weeks challenge over at Anyone for Anya? The challenge is not to be square. So, chuck those 6x6 blanks off your crafting table and get creative! We are making it worth your while too as we are sponsored by my fave store (OK, I might be a little biased)... Dies to Die For! This little card was made as a get well for one of the bestest bloggy friends who has been a bit unwell recently. She said it put a big smile on her face when she received it, so I guess it had the desired effect! Stamps: 'Nurse Nora' by CC Designs, in stock HERE at Dies to Die For. Paper: Mixture of Stampin' Up! stuff. Copic Markers: E00, E11, E29, E31, E33, E35, E37, E50, E51, E53, R20, R22, R32, R35, R37, R59, B32, B39, B45, B60, B63, W1, W3, W5, W7 - all available HERE at Dies to Die For. Tools & Embellishments: Buttons and adhesive gems from stash. Hope you can play along with us this week! Very cute card, so appropriate for a get well card. I love the stamp. I JUST bought this image!! And then I saw your card!! Wow...it is SOO cute!!! Thanks for sharing! Oh this is adorable Stacey. This is such a fab card hun and I'm glad the recipient loved it! Fab colouring as always. I was very disappointed to go back to work today after the weekend and the next one seems so far away! I'm bad for wishing the week away!! This is just such a cute card with great colour coordination and the cutest stamp that you have inspired me to order one for myself. Lovely card. 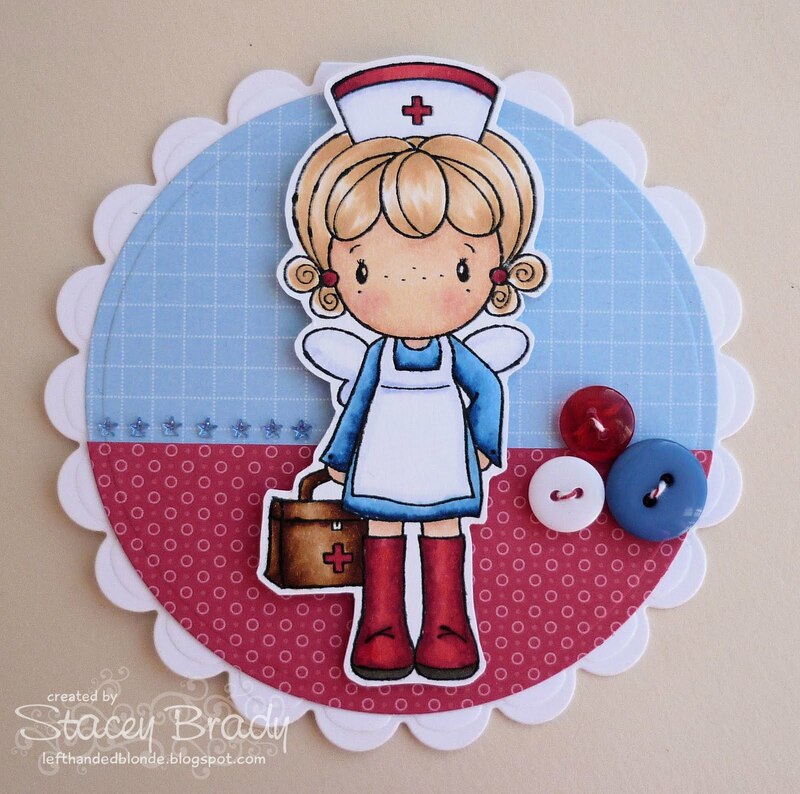 We have a DT call at the moment for a cardmaker but it runs out Friday ! check www.fiskarettes.co.uk for more details ! Sassy Anniversary Relay - Day Two! Anyone for Anya - Dawny P Sketch Time! Winner of Whimsy Blog Candy! Anyone for Anya? - Lucky Numbers! Anyone for Anya? - Lotsa Layers!